After visiting Orchha, our next stop was Agra (and the Taj Mahal) which required that we travel to Agra by train. The train was scheduled to leave at 7:30 PM. Now, the operative phrase here is “scheduled.” When we arrived at the station, our guide informed us that the train was on time. I looked at my watch and thought “we cut that a little close” because the train will be her in less than fifteen minutes. Well, 7:30 came and went. 8:00 came and went. 8:30 came and went. Finally, I asked our guide: “I thought that you said the train was on time, yet it is an hour late. What is going on?” He very patiently explained “it really isn’t late until it is over 3 hours past the scheduled time.” Now, that cleared everything up. Today’s photo is all about things standing out. As we arrived at the place to wait for the train, I immediately noticed this lady in pink. 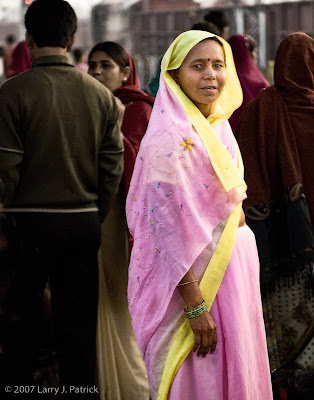 Normally, you see bright colors everywhere in India, but for some reason, in the train station most of the women were wearing less colorful clothing. Naturally, I was drawn to the bright pink. Camera settings: Nikon D200, Nikon 28-70mm f/2.8 at 70mm shot at ISO 400, f/4 and 1/250th of a second. Photoshop—used nik Color Efex tonal contrast filter to add contrast to highlight, mi-tones and shadows of her clothing. It's easy to see why she stood out, at least from this vantage point. Aside from the very colorful outfit, she seems to have connected with you while being photographed. By that I mean you captured her inquisitive look. This image looks like in post processing you had added a black and white layer to reduce the colors in the clothing of the people in the background and left the woman in pink at full saturation! And maybe even lit her with an OCF, she stands out so well. Without reading your story, I mean. I can see why she stood out to you, and it is great that you caught her engaging with you and the camera. The lighter cloth behind her on the lower left keeps drawing my eye and maybe could be darkened further. Really interesting capture. Because train stations are generally so dirty, most people in India do not wear their best clothes and also prefer darker clothes when traveling by train. A very possible explanation for this woman being dressed so totally different than most of the people is that she is going to a wedding. Again, you captured a normal scene from Indian life very well. I agree with Sira, she is probably going to a wedding. Not sure why the light area behind her bothers Cindi. It just seems to be part of the environment. Unless you have been to India, you cannot image how tightly people are normally packed into train stations. I am surprised you had this much room to photograph her. Nice reminder of home. The contrast between the subject and the background is great. You look at the photo and want to know rest of the story. A photo that has impact. The bright pink jumps out and says look at me. I like the fact that all the other people in the photo do not seem to be interested in you, but she is looking straight at you. Good eye. Good shot. Like the contrast.